Submitted by witness on Thursday, March 24, 2011. 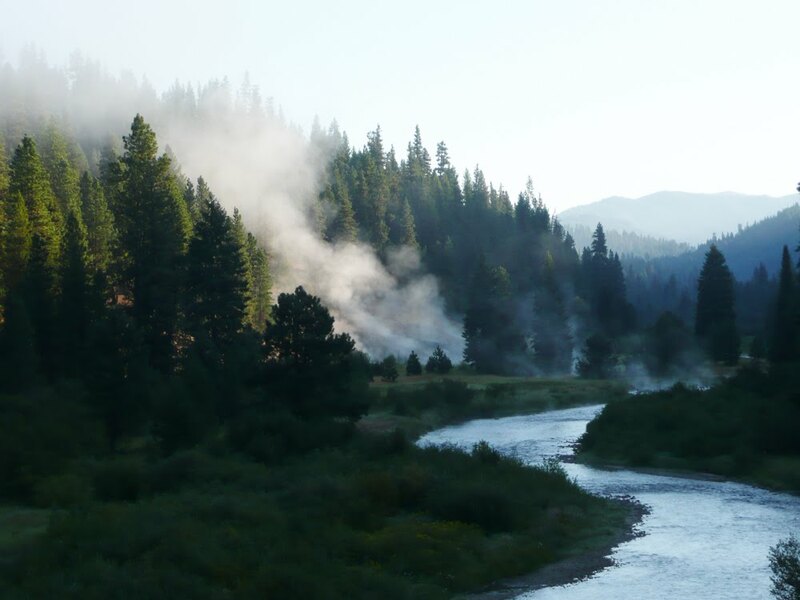 LOCATION DETAILS: Near Crouch Idaho(Valley County) about 20 or so miles up rd.# 698 is Boiling Springs Campground and a few hundred yards away is a forest service cabin and a creek right next to the campground. On November 1st 2009 around 8:00 p.m. we saw something between the trees between our sight and the rest rooms. It was walking back and forth in the clearing and swaying back and forth in the same spot when it stopped to better see us through the opening in the trees. Nothing occured to us except it maybe have been some one but we were the only campers for miles. The following year in October 30th 2010 around 10:00 p.m. at the same location we were getting spooked by the area for no reason and we actually packed up and left when again there were no other campers and we heard what sounded like a large boulder about 75-100 yards away hit the ground with a great thud. No boulder rolling or crashing down a hill but like it was thrown or dropped out of the air. No smells or sightings except a few possible 11 inch tracks in the dirt a month prior while hunting in that area. The other incident was quite interesting as well. Nearest city is Boise in Boise County going up rd. # 268 up past Arrow rock dam towards Atlanta. Willow Creek campground. It was aroung the end of August and about 2:00 a.m.. My wife and woke me and for about an hour off and on we heard what sounded like wood knocking in three different locations surrounding the campground. I explained to her what I thought it was and not to worry. It appeared that they were taking turns knocking 3-4 times a piece. Random order. Nothing else noted. OBSERVED: Heard wood knocking. Heard a boulder hitting the ground. Seen something swaying and walking back and forth. At locations and descriptions below. OTHER WITNESSES: Just me and my wife for all 3 incidents. OTHER STORIES: Not there, but my wife saw one on the side of the road Highway 27 near Sumpter Oregon. 1993 about 10:00 p.m. Described it as a dark brown, very long hair and covered its face with its arm to avoid the head lights. TIME AND CONDITIONS: All incidents at night. ENVIRONMENT: Very steep terrain at both locations. Some heavy to light wooded areas with pine and fir trees. Lots of deer and elk inhabiting both areas. Both places were near creeks. The witness and his wife were camping at a public campground when they both noticed something walking amongst the trees near their camp late in the evening. There were no artifical lights, but there was a bit of moonlight to provide some illumination. They saw a large dark shape that appeared to be about six feet tall and very broad. Because of the intervening trees, they could not make out any distinct features, but the husband was able to see that the subject was walking on two legs. It was obvious the subject knew the witness and his wife were present because it stopped and seemed to be looking at them through the trees. It swayed back and forth a bit as it did this. There were no other campers in the campground at the time. The couple became a bit spooked by what they were seeing, so they immediately packed up camp and left. The witness and his wife were again camped in the same campground. They had been hunting during the day, but had had an uneasy feeling for much of the day. The weather was cold, with a little bit of snow fall. Some time between 11:00 PM and Midnight they both heard a very loud THUD sound. It sounded to the witness as if a very large rock had landed on the ground. Again, there was no one else in the campground, and there were no nearby cliffs from which a rock could have fallen. The combination of their earlier uneasiness and the sound of a large rock landing near their camp prompted them to once again pack up and leave. This time, they didn't even bother folding up their tent. They simply threw it into their vehicle and left immediately. The witness and his wife were in a different campground when his wife woke him at about 2:00 AM to say she was hearing odd noises. The witness described the noises as a series of knocks that were quite loud and sounded like "wood-on-wood" stikes. The witness listened to these noises for about half an hour. He said they would come in a series of two or three knocks and that they seemed to be coming from three different locations on the hillsides above the campground. There were a couple other campers in this campground at the time, but the witness felt it was unlikely any of those campers were doing the wood knocks. He didn't feel it was credible to assume that three different people would climb up a very steep hillside at 2:00 AM simply to whack something against a tree. The witness did not feel alarmed by the woodknocks and eventually went back to sleep. Chuck Lamica's interest in sasquatch started at the age of 8, when his family discovered large footprints near their home in rural Oregon. He was an Alaska State Trooper for 22 years and later worked as a Forest Warden for the Washington Department of Natural Resources. He now lives in northeast Washington state.